This is a kaftan made up of very beautiful and classy colours. 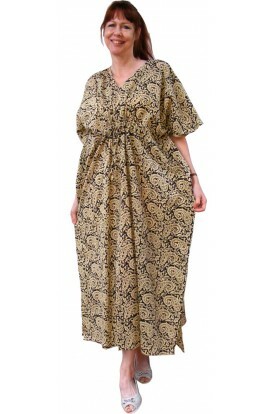 *****There is only one available***** The free-sized kaftan is suitable to loosely fit all UK dress sizes from 14 to 28 Back Length is: 54”, but this could be shortened free of charge if necessary. Please send a&n..
BLACK LACE EVENING KAFTAN The neckline is bound with shiny gold fabric. It has a little gold flower shaped button that matches the pattern in the lace. This kaftan is double layered. It is made of quality black lace and has a satin full length slip attached at the neckline. T..
COTTON KAFTAN - PAISLEY BLACK AND OLIVE ​IMPORTED Made in Indian Cotton Suitable for lounging at home. Great for the beach or around the pool Suitable to wear whilst pottering about at home Can be worn as a maxi-dress. Suitable for any bust and hip size up to 55” Length.. 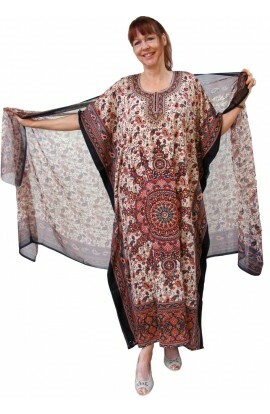 This lovely free flowing kaftan is made with your comfort and beauty in mind. The fabric is a jersey knit with gold rose-patterned overlay. The "shield-shaped" neckline is bound with matching navy jersey. This kaftan is similar to another version that has gold around the ne..
KAFTAN AND MATCHING CHIFFON SCARF - RED ROSE DESIGN There is a beautiful central rose that crowns the design of this kaftan. The very classy colours are Beige, Red and Black There is a scattered silvery toned decoration on the some parts of the kaftan. There are ..
WHITE EMBROIDERED CHIFFON KAFTAN - ONE ONLY With Wine coloured embroidery at the front. This kaftan is double layered. The upper layer is white chiffon The under layer consists of a white polyester full length slip. The two layers are attached around the neckline. This kaftan is si..